The English Language Canon EOS 5D Mark II user manual / operating instructions (Canon calls it the “EOS 5D Mark II Instruction Manual”) is now online and available for download at Canon.com (right-click and save the user guide to your hard drive). If the download link didn’t work for you, go to the drivers / software / firmware / guides and manual download section for the 5D2 and manually locate the file. 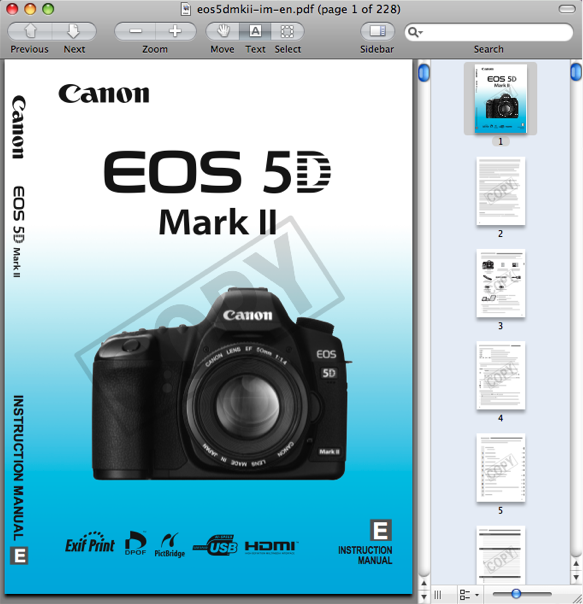 Unlike with Nikon, Canon allows you to freely print the 5D2 owner’s handbook without building in any password protection into the PDF. There is a watermark displayed on each page though. The file size of 228-page Canon 5D Mark II Adobe Acrobat PDF document is 6.1 MB (megabytes). The guide discusses the features of the 5D2 and how to use the camera. 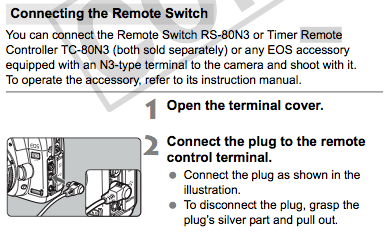 The manual explains how to connect a Remote Switch RS-80N3 or Timer Remote Controller TC-80N3 to the 5D2. Another example of a remote accessory for the 5D Mark II is the Phottix Cleon C8, a wireless RF (radio frequency) remote shutter release. At the time of writing, the 5D Mark II is the only non-Rebel camera in the EOS lineup to feature an IR (infrared) remote control sensor on the front of the body. 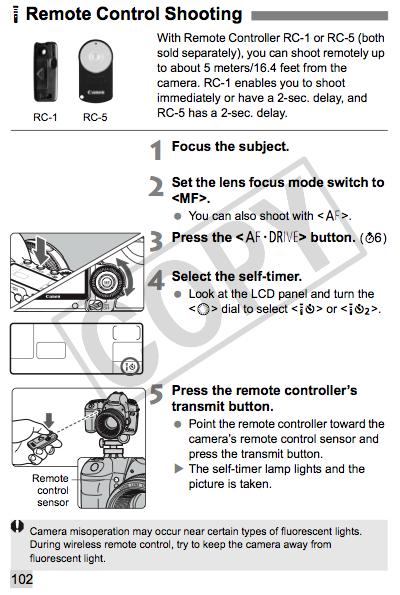 This allows you to use the Canon RC-1 or RC-5 infrared remote control units to trip the camera’s shutter. You can also shoot BULB exposures, see Wireless infrared remote triggers for the Canon XSi / 450D for details, and also for the differences between the RC-1 and RC-5 remote control units..